These gloves are the most versatile protection for hands that money can buy. 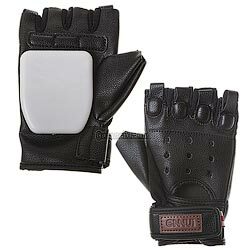 Specially designed for freeride longboard and powerblading, the knuckles and palm are protected against impacts by the EVA inserts and the removable thick puck made of long lasting PP material allows for eventual hand slides*. The mesh lining and the vent holes make them totally breathable to keep your hands fresh and dry even during summer season. The short cut and the fingerless design eliminates any of the restrictions of usual downhill gloves, you can move your wrist and fingers in all directions with absolute freedom: hold a can, attach the buckle of your helmet, eat a hamburger, open a bottle or grab your board with no need to remove your sliding gloves. Not to mention how great the black leather looks!